The 2007 <?xml:namespace prefix = st1 ns = "urn:schemas-microsoft-com:office:smarttags" />China (Chengdu) International Science Fiction and Fantasy Conference concluded on Sunday in Chengdu, southwest China's Sichuan Province, with the presentation of the Galaxy Award of 2006 for best science fiction writers and books. The annual award is sponsored by the Science Fiction World magazine, China's most respected sci-fi publisher, and is generally regarded as the top award in the genre. 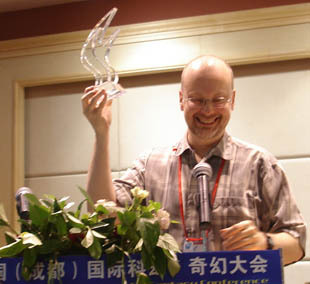 The Most Popular SF Author Award went to Robert J. Sawyer from Canada. Robert J. Sawyer was dubbed "the dean of Canadian science fiction" by the Ottawa Citizen in 1999 and is the double winner of Canada's top award for science fiction and fantasy literary works Aurora Awards. Chinese science fiction writer Liu Cixin took home the Special Science Fiction Award for his book Three-Body and Wang Jinkang was honored with a Best SF Short Story Award for Ultimate Explosion. Both Liu and Wang are seen as masters in Chinese sci-fi circles. 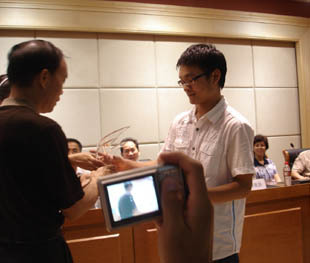 However, the next generation was also accounted for with younger writers such as Chang Jia (pen name) being rewarded with a Best SF Short Story award for his book Kunlun. 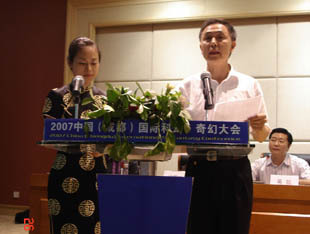 "The Chengdu science fiction and fantasy conference offered a rare opportunity for science fiction and fantasy writers, critics, researchers and fans from both home and abroad to share their views and their writing experiences together and this has strengthened their mutual understanding and fostered a deeper friendship," said Li Hongfu, vice chairman of Sichuan Provincial Association for Science and Technology at the closing ceremony. "I believe this conference will bring about a positive influence on science-fiction and fantasy literature, in China and around the world." The conference attracted some 70 science fiction and fantasy writers, critics, researchers, and astronauts as well as over 5000 fans. These congregated to twenty-three lectures and an imaginative literature summit which focused on different aspects of science fiction and fantasy writing. After the Chengdu conference, science fiction and fantasy writers will move on to Yokohama, Japan for the World Science Fiction Convention, which will open on September 1.